I am an exercise cheat. Yup, I admit it and by saying that I cheat, I mean that I move frequently from one exercise to another in search of the newest and latest craze that will keep me from being bored with any one routine. So what’s my latest exercise? Pole dancing! It’s a workout that combines aerobics, dance, yoga, and strength training. There’s a plus side as well to this type of exercise. The classes offer women the opportunity to let loose and have fun while toning our bodies and increasing our core strength. Once featured only in ‘gentlemen’s clubs’ and strip joints, pole dancing is emerging as the latest exercise craze. The only exercise I have stuck with is dancing but even that has had many incarnations. Bhangra, belly-dancing, Branceé, and the hula have all been favorites of mine at one time or another. Always on the lookout for a new type of exercise to alleviate getting into an exercise rut, I decided to give pole dancing a shot and signed up for four weeks of lessons three times a week. There were six women in the class, all eager to try this new dance form. At my first class our instructor Callie, who is incredibly fit and toned, demonstrated how we would use the pole. When she did it, it looked easy. All right, I thought, this is dancing, I can do this. I take Ballet Barre, I play tennis. No problem. Uh-huh. 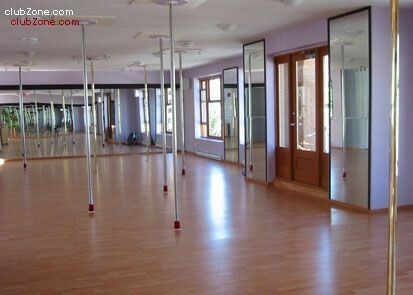 Like all dances moves you see on stage or in movies, the steps for pole dancing have different names. The first move we were taught was the Fireman’s Spin. You do it by hooking your legs around the pole at mid-level and spinning down the pole to the floor. The Corkscrew, literally winding your body around the pole, was a bit harder. Both were strenuous and more challenging than any other dances I have ever done. We all tried, we were in the moment. We strutted, we pranced, we worked that pole! This was fun, this was exhilarating; this was exhausting. I was definitely challenged. I took to it like a little girl in her first pair of tap shoes takes to a stage. I was hooked, my aching arms and legs notwithstanding. I was going to pole dance! Callie did tell us that we needed to build up our upper arm strength; we were lifting our own body weight after all. Some weight lifting of 8 pound weights would benefit us all, she said, demonstrating arm curls. We prevailed and two weeks later all six of us were able to do the Caterpillar, which entails climbing the pole and then slithering down head first without falling on our faces. I secretly blessed my Ballet Barre dance instructor who constantly pushes stretching and flexibility. I had no problem getting my right leg up the pole while my left leg was hooked around it. The problem was letting go and not falling backwards but I did it and felt a major accomplishment had been done. It’s no secret that dancing fitness classes offer tremendous benefits to professional dancers and athletes. You’re not bored because there are always new moves to learn and your body responds to the challenges. Pole dancing tightens everything; arms, legs, and abs. But be warned, even habitual exercisers are surprised at how fatigued and sore their bodies are from pole dancing for a few weeks. Staying with it brings physical benefits and energy. Besides the enormous physical benefits of pole dancing, there is something else. You get a wonderful sense of empowerment that comes from being in charge of your body. It’s healthy, it’s powerful, and nothing like any other exercise I’d done before. I’m sticking with it. As I signed up for another six weeks, Callie gave me and the other women a warning; in order to continue to reap the physical health benefits from it, pole dancing is an exercise that you have to keep doing at least once a week. That’s fine with me. I’m already looking for the perfect place in my house to put up a pole. Kristen Houghton is the author of nine novels, two non-fiction books, a collection of short stories, a book of essays, and a children’s novella. The first 4 books in her best-selling series, A Cate Harlow Private Investigation, are now available in a boxset. Kristen Houghton has covered politics, news, and lifestyle issues as a contributor to the Huffington Post.